Are you cool enough to strap two wearables to your arms at once? The makers of the Misfit Shine fitness tracker think that you are. The company's new app for the Pebble family of smartwatches allows both devices to stay in sync, but it needs a smartphone in the middle (Android or iPhone) and apps for both the Misfit and the Pebble on the phone, too. What an age we live in. Sarcasm aside, there's a good reason to wear a Pebble and a Misfit Shine at the same time: the Misfit doesn't have its own screen. So when both gadgets are paired, the Misfit gets a readout that doesn't require reaching for your phone, and the Pebble gets activity tracking capabilities that are beyond its relatively simple hardware. 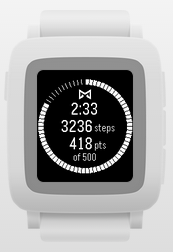 The Shine tracks steps, distance, calories burned, and sleep statistics. 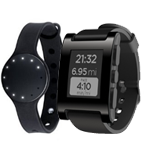 Of course, all of those can also be tracked with various Android Wear apps, and a single Wear device can be much cheaper than the Shine + Pebble combo (both have a $100 retail price). But if you've already got both and don't want to spend any money on new hardware, this seems like a pretty neat solution. 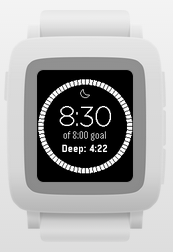 As some of you pointed out, this functionality doesn't require you to have both a Pebble and a Misfit. 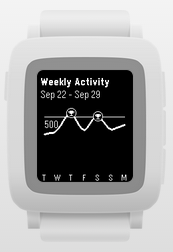 In fact, the Misfit app for the Pebble effectively makes the smartwatch act like a Misfit, so you can save on buying a separate activity tracker. Previously, the Pebble app logged sleep and steps locally on the watch, so you only had access to 7 days worth of data without any detailed graphs or lengthy history (like Rita pointed out in her Misfit review and comparison). Now, it syncs to the Misfit Android app, allowing you almost all the privileges of owning a Misfit without actually paying for one.